New finished screen print, first one of 2019! Spring beach people print complete. This will be popping into my online shop as soon as I have some better images of the artwork ready. Please message me if you would like one sooner though! 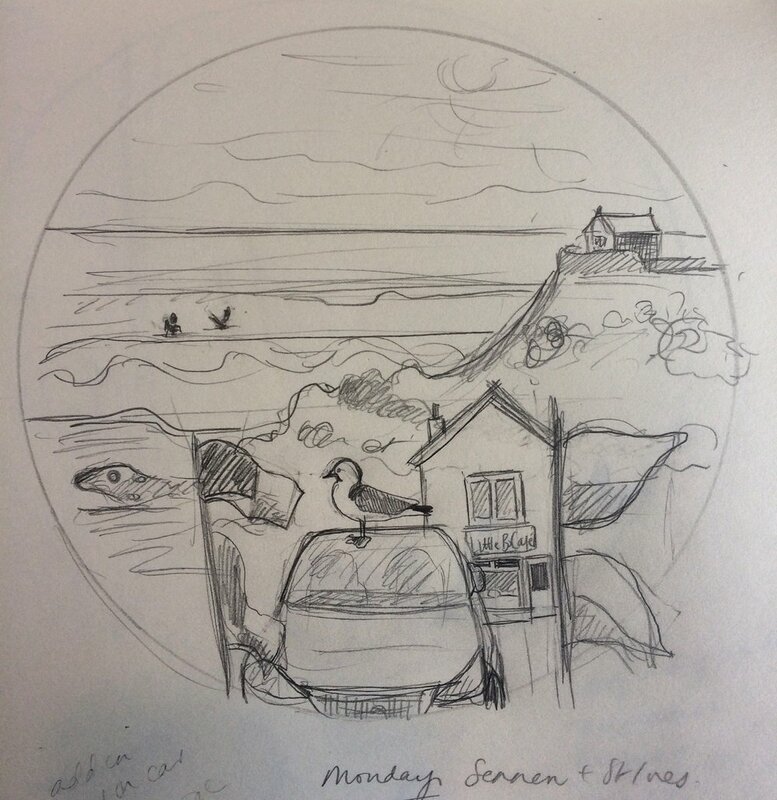 This is the second in my series of seasonal beach people screen prints showing how differently people enjoy the beach in different seasons, and the third (summer) is already art-worked and ready to be exposed onto screens. I’m a bit slow with my posting lately, its was a busy patch in the run up to Christmas with markets and printing! Here as some pics of my marquee at the brilliant Braunton Christmas Market. A big thank you to everyone that stopped by to look at my stall and chatted, and especially you lovely folk who bought stuff! Again, my ingenious fella had a brilliant idea to save me spending anything on a table for Thursday's market. My table has come together nicely from old floor boards from our house. 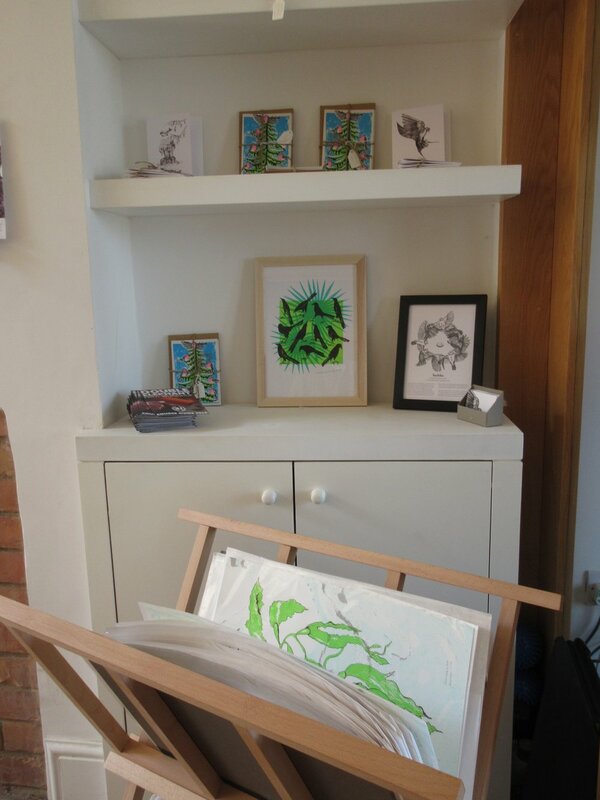 I really like the idea of having a bit of the new Devon home that has allowed me the time to be creative and given me the space to screen print, to come with me to the market! Check out my online shop to see what I'll be selling on Thursday and order anything you like if you can't make the market in Braunton from 10am - 4pm. Becoming a market stall holder, ah me loverly captain hooks turned out right robin! My new drying rack hasn't turned up in time for the printing to begin, but the boyfriend had a brilliant plan b suggestion. Who needs fancy equipment when you have an innovative fella on hand?! The rhyming slang is improving and so are my stock levels ready for my first market stall day next Thursday. Today I got the first colour printed for the first 2 designs of my lovely new notebooks which really looking forward to debuting! (I'm also working on some new icecream greeting cards). Becoming a market stall holder! I'm practising my best cockney rhyming slang ready for my new Thursday market stall at the Braunton Contemporary Craft Market! I'll be there from Thursday 12th July, but the market is on this Thursday if you are in the area and want to check it out. As I've never done this before to sell my prints, I thought I'd chat about my progress so anyone else doing this for the first time might find it helpful. (posts will not just involve learning rhyming slang, i promise! I had the chance to have my work for sale at the WaveProject stand at Oceanfest, with 25% of sales going to this fantastic charity. 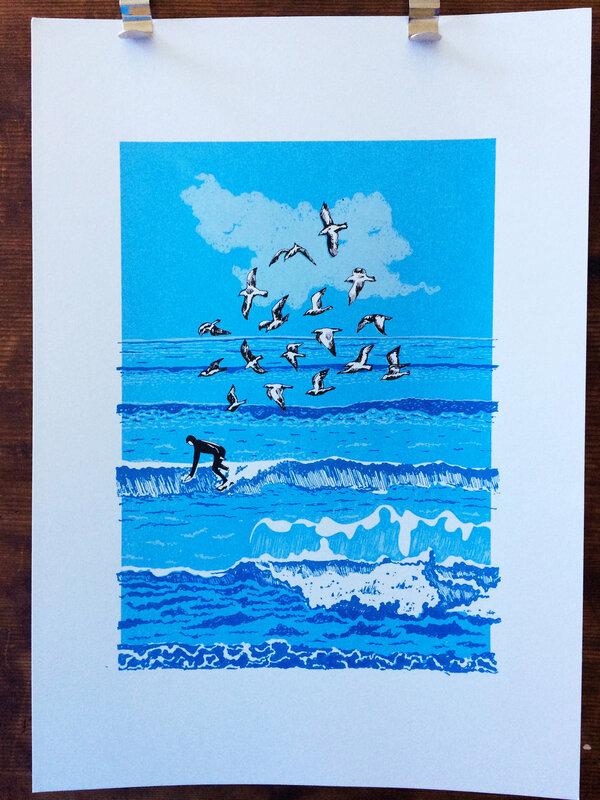 I wanted to create a screen print just for them, that showed how great surfing is for making the world a better place and easing day to day stresses and worries. Its been a while since the art trail, but I had a brilliant time and met some fantastic people. 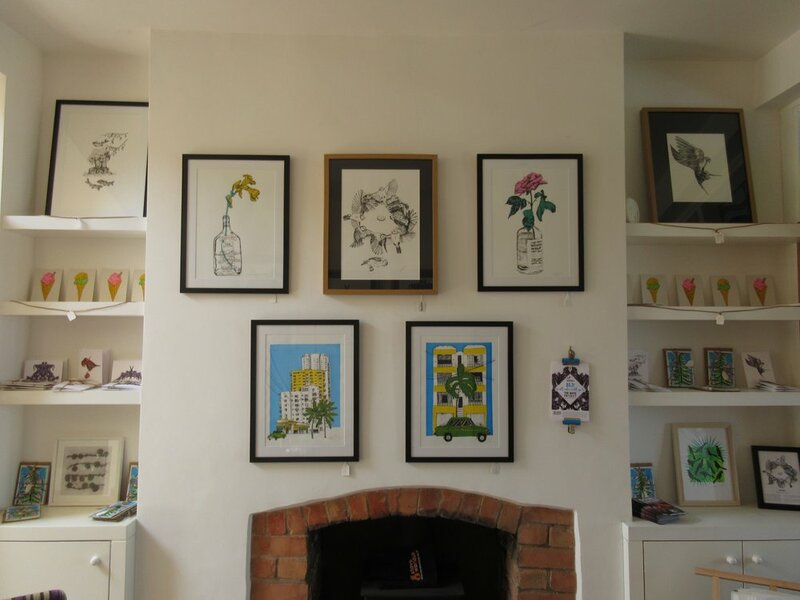 I have finally got my feet back on the ground so I wanted to share some pics of how fantastic Steph's house was for displaying work (you'd never guess I have dreams of having my own shop one day!! 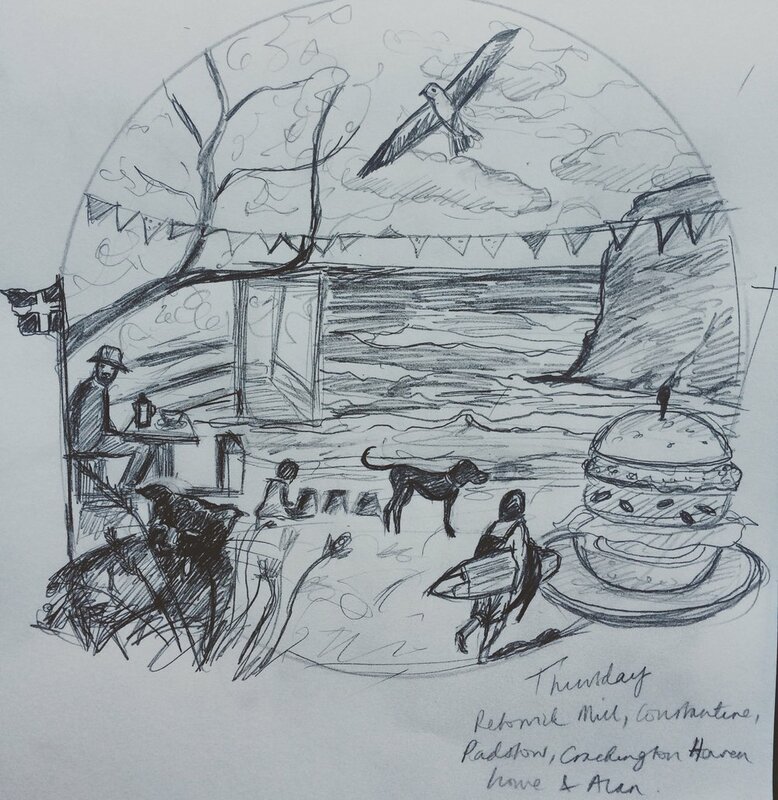 I've just been on holiday to Cornwall for a few days, and as this is one of my favourite bits of the UK I wanted to keep a scribble diary of where we went and what I saw. Here are some of my scribbles. Big news, I've got two t-shirts for sale with the lovely Everpress! Rorschach Evil & Beauty and Rorschach Life & Death, both £22.00 each. I've been working hard screen printing a collection of new artworks ready for the Ilfracombe Art Trail this weekend. Please come and say hello if you're in the area! 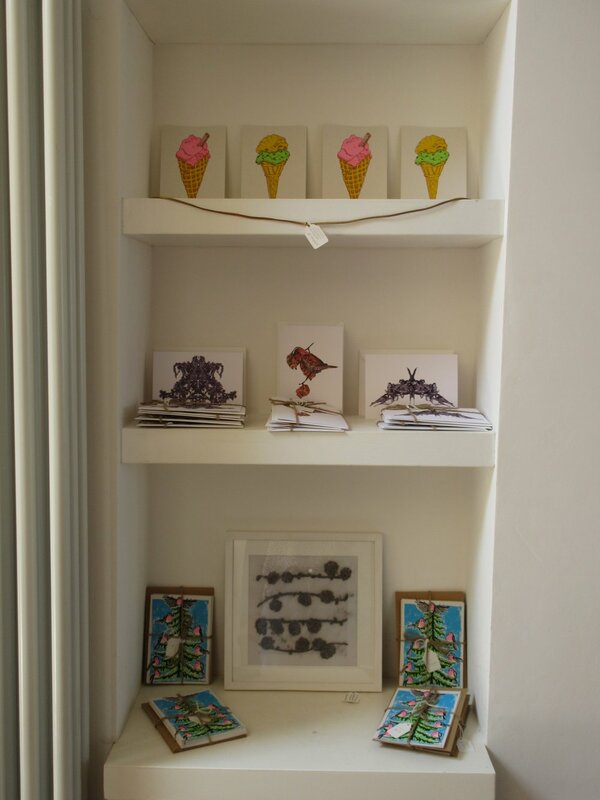 I'm really excited to have my pictures up and for sale at the lovely Woodlands B&B in Ilfracombe! 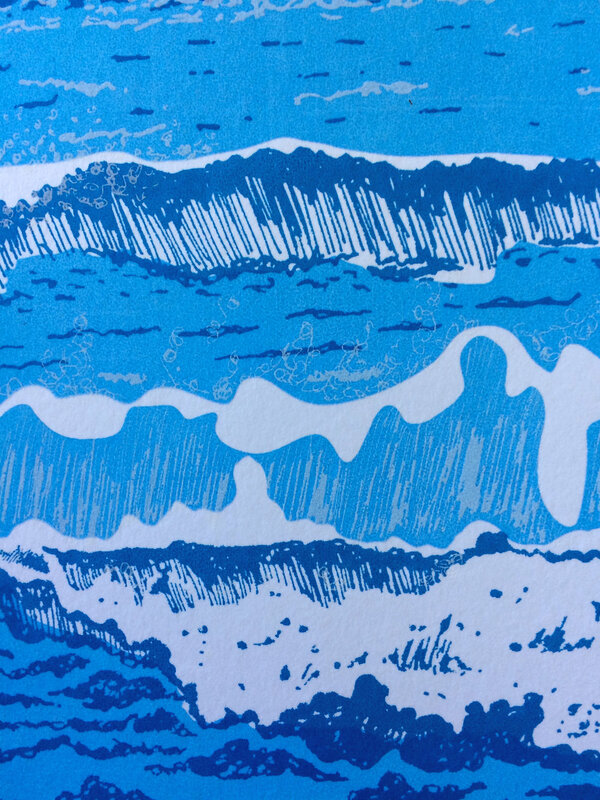 After the nicest morning screen printing at Double Elephant in Exeter, I have a new print for sale in my shop. Hand screen printed proof that weeds are beautiful too. I did a lovely screenprinting onto fabric workshop last night at tea and crafting in Camden. It was really satisfying to see how simply you can make a stencil and screenprint onto a bag. More of this sort of stuff to come I reckon, screenprinting is the future! New illustrations for Esther Finn's children's story about inexperienced witch, Ellsie. More illustrations to come! First three images in a new series of sketches considering young people trapped by their various demons, nature or nurture? I did warn you that I was a Christmas fan, Have a great Christmas and a Happy New Year!